Doberman Pinscher- Fierce Guard Dog Or Loyal Family Pet? You are here: Home / Breeds / Pure / Doberman Pinscher – Fierce Guard Dog Or Loyal Family Pet? The Doberman Pinscher is by no means a new breed. Regal and proud, standing alert and obedient, the Doberman is famously known as a guard dog and military breed! Still, there are many myths and mysteries regarding this handsome and intelligent animal. If you’ve found yourself curious about the Doberman Pinscher or have ever wondered if they would be the right addition to your household, you’re in luck! 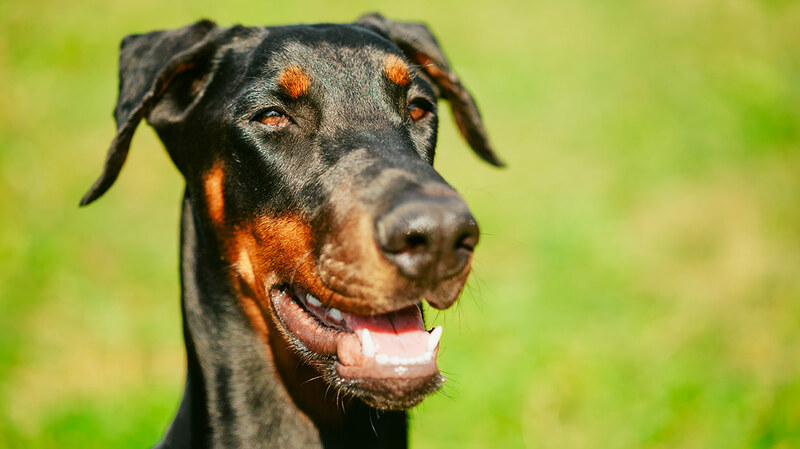 In this article, we will cover everything you need to know about the Doberman Pinscher, including their origin, temperament, and even what kind of pet they make. What is a Doberman Pinscher? The Doberman Pinscher is a large, gorgeous dog breed. The Doberman was regaled as an obedient, intelligent family pet—especially during the 1930’s—known for their eagerness to please and ease with children. So what about the aggression we’ve heard so much about? There are plenty of opinions when it comes to the Doberman Pinscher breed—not all of them have positive attributes. Although it’s true the Doberman has a reputation for being aggressive and intimidating, the truth of the matter is, it’s not really all that cut and dry. A quick glance at the history of the Doberman Pinscher should help us to better understand what makes them what they are today. Hopefully, by gaining a better idea of how their reputation came to be, we can ensure a positive experience with them as household pets! The Doberman Pinscher originally hailed from Germany sometime in the 1890’s, where they were first developed by a man named Karl Friedrich Louis Doberman. Doberman was a tax collector in Apolda, which was apparently considered some pretty dangerous work back in the day! Since his work was putting him in some rather precarious neighborhoods, Karl Doberman sought protection in the form of a guard dog. The mission inspired Karl Doberman to create a new breed of dog that he considered to be a mixture of strength, loyalty, intelligence, and ferocity! As the years passed, the breed was transformed into the modern-day Doberman Pinscher we know today. Characteristically, the Doberman is a medium to large-sized dog renowned for their intelligence, loyalty, and obedience. Surprisingly, the Doberman Pinscher’s reputation was not always so ferocious. In fact, according to Karen Delise’s book, The Pit Bull Placebo, Doberman Pinschers were celebrated in the early 1930’s and 1940’s for their bravery and loyalty. Stories can be found of Doberman Pinschers rescuing young children and protecting their owners! One famous Doberman Pinscher was even recognized by the Humane Society for rescuing its three-year-old charge from a rattlesnake! Because of this, Doberman Pinschers were hailed not only wonderful guard dogs but as honorable family dogs with an excellent reputation around children. It’s thought that the Doberman Pinscher’s reputation was not seen as vicious or unpredictable until World War ll. At this time, depictions of Dobermanns standing alongside Nazis began infiltrating national news outlets. However, it didn’t seem to matter that Doberman Pinschers played a huge role in the US Marine Corps. Their reputation quickly became that of a vicious, unpredictable dog. The Doberman Pinscher has struggled to recover from its ‘devil dog’ reputation. Yet the Dobermann still manages to make it to number 15 on the American Kennel Club (AKC) registry for America’s most popular dog breeds! Today, the Doberman Pinscher is regarded as a proud and intelligent dog and with proper training and socialization, they can make a wonderful family pet, service animal, or military dog. After World War ll, the Doberman Pinscher struggled to rebuild his reputation as a decent pet who displays great intelligence and loyalty! Although Dobermans are now known to exercise restraint and excel in obedience, they were originally bred as a guard dog. For this reason, they are fearless and protective dogs created to look and behave in an intimidating way if necessary. These traits do not always translate well as a companion dog. But thankfully, modern-day breeders have worked hard to tone down these qualities. In fact, modern Doberman Pinschers are considered to be mild-mannered, trainable, and very friendly. A prospective owner should still implement proper training and early socialization with their Doberman Pinscher. It’s also a good idea to supervise your Doberman Pinscher around small children and strangers since Doberman’s still retain the guard dog instincts they were originally bred to have. The Doberman Pinscher is a medium to large dog with a regal appearance and watchful gaze. A full-grown male Doberman Pinscher can be 26 to 28 inches tall, and females grow to approximately 24 to 26 inches. Males will weigh between 75 to 100 lbs and females weigh 60 to 90 lbs. The Doberman Pinscher is athletically built and stands tall and powerful with an alert, intelligent expression. They have a shiny coat and naturally floppy ears. The Doberman Pinscher was routinely depicted throughout history with cropped ears but this has quickly become an outdated practice. Although the Doberman Pinscher has a short, sleek coat, they do shed regularly and will require some brushing to manage loose hair and keep their coat healthy. Otherwise, the Doberman is a relatively easy dog to care for requiring only occasional bathing. A prospective Doberman Pinscher owner should also make it a habit of cleaning their Doberman’s ears regularly to keep wax and moisture at bay. Your Doberman Pinscher will need their nails trimmed weekly to avoid splitting and cracking. Considering the Doberman Pinscher has a guard dog history and protective instincts, it’s important to implement proper training and early socialization. This will ensure your Dobermann will be well adapted to their new environment. Luckily, the Doberman Pinscher is known to be incredibly intelligent and obedient, therefore, prospective owners can expect their Doberman to be easy and fun to train! Because they are such brainy dogs, Doberman Pinschers enjoy mental stimulation and challenges in addition to physical ones. For this reason, it’s best to regularly provide tasks for them to complete and to teach your Doberman Pinscher some tricks to keep them mentally sound. It’s important to start training as early as possible, as untrained Dobermans can become pushy and even destructive. As always, be sure to keep obedience training fun and positive! This will ensure an enjoyable experience for both you and your Doberman Pinscher. 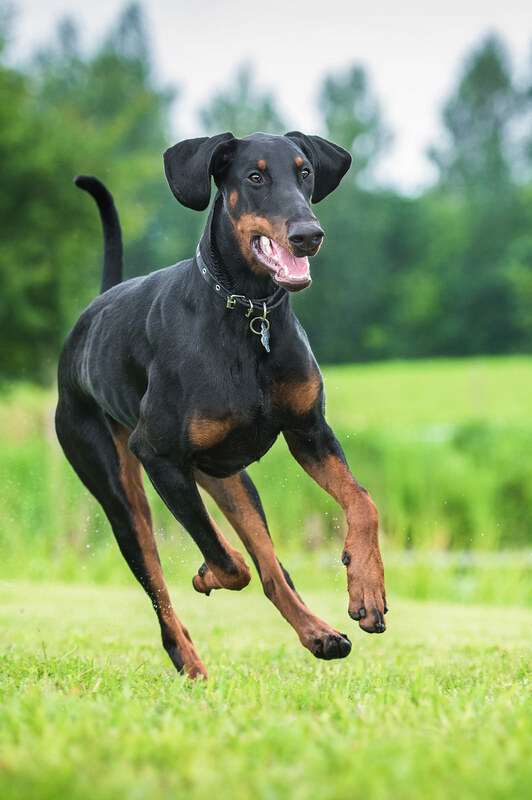 Keep in mind the Doberman Pinscher is an energetic dog with an athlete’s stamina—large in size requiring an adequate amount of exercise to keep them happy and healthy! The best forms of exercise include long walks, runs, and lots of free play. With proper training and early socialization, and of course supervision around small children, the Doberman Pinscher can make an excellent companion and family dog! A healthy Doberman Pinscher will live an average of 10 to 13 years. As with all purebred dogs, the Doberman Pinscher is predisposed to a number generational health issues. Keep in mind that not all health issues are genetic and other factors such as environment, diet, and exercise will also play a big role in your Doberman’s health. Still, it’s always best to extensively research any health issues in your Doberman Pinscher bloodline to ensure you are prepared for any issues in the future. Keeping the above in mind, an early health screening of your Doberman Pinscher can help avoid or prepare for future health issues. Remember that reputable breeders will be able to provide certificates regarding the health of the parent breeds, proving they have been screened and cleared of certain health issues. You can learn more about specified health testing requirements from the American Kennel Club (AKC). Because the Doberman Pinscher is so athletic and intelligent, they do best in homes with a large fenced yard—free to roam and play. With proper training, they are loving and loyal pets, however, Doberman’s need an owner who is able to offer adequate obedience training. An added plus would be if you’re someone who enjoys an active lifestyle that you can share with your Doberman Pinscher. The Doberman Pinscher is excellent around children provided they are properly trained, but supervision is still recommended, particularly around younger children. The Doberman Pinscher is a shedder so allergy sufferers should bear this in mind. Buying your Doberman Pinscher from a reputable breeder is of utmost importance. We recommend doing plenty of research before you decide where you get your Doberman Pinscher puppy. Shelters can also carry all types of breeds and crossbreeds, however, finding a Doberman Pinscher at a certain shelter can be hit or miss. Although most shelters incur fees, they are often a fraction of the costs that breeders charge. You should prepare for adoption fees to be anywhere from $50 to $100. Most shelters will cover initial veterinary fees to ensure your dog is suitable for adoption and ready for their forever home! If you do choose to adopt from a shelter, be sure to ask about temperamental issues and any known health problems. Keep in mind that much of the history of your Doberman Pinscher may be a mystery, so be wary of introducing them to strangers and children. That is until you’re sure they’ve been adequately trained and socialized. If you’ve, instead, decided to buy your Doberman Pinscher from a breeder, be ready to spend anywhere from $500 to over $1,000. The cost will depend on both the breeder and the history of your Doberman’s parents. Again, always do your research and make sure you look into the history of your Doberman Pinscher puppy’s parents. It’s also important to ask about temperamental issues with your Doberman’s parents and previous litters, as well as any health concerns that have arisen in the past. Reputable breeders will be able to provide health certificates to prove their dogs have been adequately screened. If you’re still unsure about where to find your Doberman Pinscher puppy, you could always attend a local dog show—networking at events like these can often point you in the right direction. You can also find information at your local AKC club and can help you find the right breeder. Is the Doberman Pinscher the Right Dog for You? Doberman Pinschers have a reputation for being ferocious and dangerous, however, they can, in fact, be kind and loyal family dogs. Remember, though, your Doberman will be highly intelligent and require plenty of training and consistent exercise so make sure you’re up to the task! Also be aware, you may need to supervise them around young children. Have you decided to take home a new Doberman Pinscher puppy? Do you have any experience with Doberman Pinschers? Let us know in the comments below. Hazlett MJ et al. 1983. A retrospective Study of Heart Disease in Doberman Pinscher Dogs. The Canadian Veterinary Journal. Delise K. 2007. The Pit Bull Placebo: The Media, Myths, and Politics of Canine Aggression. Anubis Publishing. Howell TJ, King T, and Bennett PC. 2015. Puppy Parties and Beyond: the role of early age socialization practices on adult dog behavior. Veterinary Medicine: Research and Reports. Sutter NB and Ostrander EA. 2004. Dog Star Rising: The Canine Genetic System. Nature Reviews Genetics. Nature Reviews Genetics. Irion DN et al. 2003. Analysis of Genetic Variation in 28 Dog Breed Populations With 100 Microsatellite Markers. Journal of Heredity. Acumen L. 2011. The Genetic Connection: a Guide to Health Problems in Purebred Dogs. Second Edition. American Animal Hospital Association.